Every individual has to lead a life with ambition. Motivational talks from great people will improve our ideas to reach our aims and ambitions. Having a talk on great leaders will spark some innovative ideas. You may get a role model by that inspiration talk. Have a look at all great leader’s biography, their experiences and hurdles that they crossed achieve people’s respect. Every individual has a different point of view to inspire great leaders and analysts. 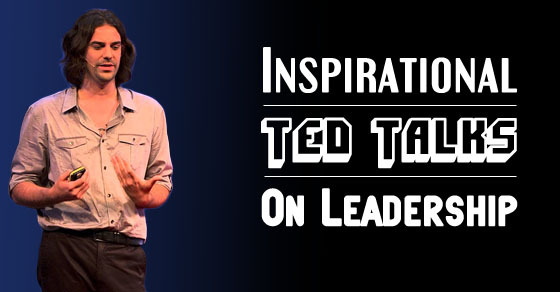 Some of the inspirational ted talks on leadership. Below mentioned are some of the top TED talks leadership videos which can change the point of view of leaders and managers. As part of her discoveries, she met Benki She gave a talk about him. He is the leader of Ashaninka Nation, he lead the people living in Brazil and Peru. Benki belongs to Amazon, one of the remote location where there is no proper transportation facilities. He became a leader at the age of 10 to the people who live in that area, his grandfather died at that age and he had to lead the people. Benki observed the visitors from other parts of world cutting down their forest and exporting them to the world, then he educated his people on how to survive for their food, introduced new technologies to protect his nation. Miurin asked him why was he doing all this for his nation, he only answered that I questioned myself that what my forefathers did to me, the same question I don’t want to hear from grandchildren, hence he brought a great change to his nation and protected it from the deforestation. Simon Sinek gave a brilliant example on how people get success, how Apple CEO and Martin Luther King are different from others. We may compare what is the difference between us and the Apple founders. Simon found a discovery a few years ago on this, he says that many companies sell same product like apple, but why is apple company different from others, it’s because they think how, why and what. How they do it, why do they work, what brings them profit, all inspired leaders think, act and communicate, this is why they are success. He gives an example, Dell also makes flat screen TV and apple also but why do Dell products don’t get sell and why Apple products get profit, its because Apple believes on what people believe, people don’t buy whatever any company does, they will buy because why a company is doing it. The above mentioned is ted video on How great leaders inspire action by Simon Sinek during ted conference. He tells about the world’s best music conductors. Conductors do not speak a word but they monitor only with their hand gestures, eye expression and body language, anything wrong might happen if he gives a wrong instruction, but he balances well. The conductor must be responsible to make here the story of the music to the audience and the story of every orchestra member. The conductor as a leader gives a lot of energy and confidence to the members, that is how they drive unity among themselves. She talks about the percentage of women leaders, she found that they are only a few women at the top position, women should start believing in themselves, do not underestimate your ability, they think they don’t deserve the success, she gives three messages to the women who wanted to work. The first message she says is that “women should grab the opportunity, she should outcome herself from her limits and try to reach the opportunity” .The second message is “Make your partner a real partner, if a woman is working she has to manage both house and work but for men only career, he only has to work, try to distribute your responsibilities and share your burden this will also help women to achieve targets”. The third message is “Don’t leave before you leave, forecasting your future problems like pregnancy and marriage, do not give up the current opportunity, do not give up promotions or projects. When the problem is too far, when you really have to take a break, then think of leaving, until then do not leave opportunities. This is one of the most watched ted talks on leadership and women empowerment. He talks about how making a movement, the leader should always have dare to start. He says an example, a guy stands out first, then he calls his friends to join then the crowd joins them, then they start a movement. Now the crowd remains as followers, but the first guy who took the initiative will be called as a leader, to start a movement you should have the courage to start it then the others will follow you. Patrick Awuah talks about how to educate leaders, he is part of the Renaissance in Africa. He says that his continent has many opportunities to stand out the best in the world, the leaders should be educated, it’s not that whatever orders is passed are influenced on people, their decisions may end up the society with huge losses. Patrick himself saw an example in his life, he was a part of Microsoft, his job is to create new software and introduce to the world when he was working the company annual revenue was at peaks when he left the company it has a downfall, this shows the importance of leadership. She says that we heard many inspiring stories of leaders, why are they different from them, why can’t we become like that, she says that children should take charge to change the nation through the word “I can” this is enough to show their abilities, they should see school and life as similar, aware of things around, enable them and empower the change. She gave an example when the speaker was learning about child rights in her school, one of his classmates went to his teacher and told him that it’s not possible to abolish child labour until they were out of the school, he started awareness in the city and spread the infection called “I Can do it”, on the other hand, they obtained good grades in their class and also changed society. She says the slogan we the people of the country if not we who will change when will change and how will change the country. So, being infected by the words “I can” helps our country to change. This is one of the most inspiring ted talks. This is one of the most popular ted talks on leadership. Dank pink says that there is a difference between what science knows and what business is done. Here is what science says, rewards are a natural part, do work with a goal, secondly rewards may lead to worse creativity, third: those who invented things are not because of the rewards and punishments but because of their instincts, the aim that drives in their mind allows them to do better but not rewards. If we work with motivation, avoid being lazy to achieve business needs. We can repair the difference between science and business and this will lead to change the world. Jason says that why work doesn’t work at work, she asked many of them where do you really want to go when you have to do something here. No one answered its office, she got answers like coffee shop, location or a room or about time. Many of us do not work 8 hours continuously in one place being uninterrupted, they work for 10 minutes and be pulled by someone else, after 20 min someone else may call. Like that we do not actually work continuously for 8 hours they will be distracted by one thing or other, whereas the great innovators spend hours and hours uninterrupted so that they have focus and get things done. For example, we all have two or three meeting in a day, Jason says that do not move, the work will be get distracted, so meetings and managers will distract the work, just give a try have a day without moving. If they the managers do interrupt them, there will be surely so much amount of work to be done that day, do not move, use communication to get updates from your employees they will check the mail or messenger whenever they are free and update status to their boss, this will really work and your work will be done. To end this discussion, we would surely comment that these above-mentioned leaders have made their impression in this world through their point of view. All these kind of statements given by these leaders has educated all the managers and leaders to start their creative ideas into reality. Therefore, if a person decides to follow all the above-mentioned statements or ted talks from these well popular leaders then it is possible that they can achieve their successful career as soon as possible.